– Is the FICA tax a tax? Does Obama really want to go there? Why stop at the 1950s? 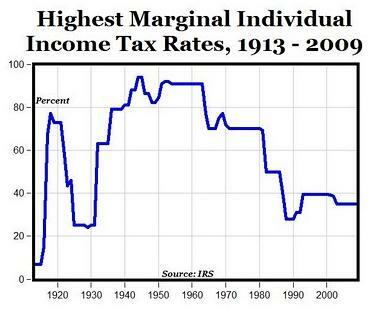 Why not go all the way back to 1913, or 1926, when top marginal tax rates were only 7.0% and 25.0%, respectively? And if top marginal tax rates are lower today than they’ve been since the 1950s, are they not also lower than they’ve been since 1964? For what it’s worth, I know that within my lifetime, top marginal tax rates are higher today than they were in the late 1980s, and lower than they were for most of the 1990s, but as for the 1950s, why should I care? That was before my time as well. If I understand Obama correctly, what he’s saying is that if you were a wealthy CEO or a hedge fund manager in the 1950s, your taxes are lower today, than they were back then. But, if you were a wealthy CEO or a hedge fund manager in the 1950s, and are still breathing, you’re probably well into your 80s and could care less, like me. Enjoy forking over the paltry 35% of your earnings for your remaining years, and don’t forget the Social Security, Medicare, and State taxes. I mean, if anyone deserves a break, it’s our elders. Now, I wasn’t born until 1960, and didn’t start working consistently until the 1980s, and I think my Mom was only 12 in 1950, so is anyone around today who can relate? The truth is that for anyone to have entered the workforce, at say the age of 18, in 1950, would make them at least 79 years old today. And anyone who entered the workforce at the end of that decade, in 1959, would be at least 70. So in order to have been in the prime earning years back then, ages 30 to 50, would make one well beyond 80 years of age today. For example, Alfred Winslow Jones (9 September 1900 – 2 June 1989), who formed the first hedge fund in 1949, would have been 111 years old by now. And, since the average age of a CEO in the United States, today, is just 56, most wouldn’t even have been born until the mid-1950s. The fact that there aren’t any CEOs or hedge fund managers around today, who were in those positions in the 1950s, leads anyone paying attention to think that Obama is out of touch with reality. And that’s putting it kindly. Winning The ‘50s – At least in the 1950s, everyone had skin in the game. If you had taxable income of under $32,352, in 2010 dollars, your marginal tax rate would have been 20%. If you had taxable income of $250,000, in today’s dollars, your marginal tax rate would have been 47%. And if you had taxable income of over $1,000,000, in 2010 dollars, your marginal rate would have been between 78% and 91%. So is this what Obama wants? If so, he should change his slogan from “Winning the Future” to “Winning the ‘50s”, or something. Nobody really knows what Obama is bloviating about, but just for the heck of it, let’s analyze whether the amount of personal tax revenues collected, as a percentage of GDP, was any higher in the 1950s than it is today. The chart below was derived from statistics published by the U.S. Bureau of Economic Analysis. According to the data, personal taxes, as a percentage of GDP, averaged 7.6% in the 1950s, and 7.5% between 2001 and 2010. So in that sense, Americans are paying a whopping 1.3% less in personal taxes than our grandparents, and great-grandparents paid back in the 1950s. I included federal government spending just out of curiosity. It turns out that government spending as a percentage of GDP, while only averaging 16.4% in the 1950s, has averaged 21.3% since 2001. So it appears that the percentage decline of 1.3% in personal taxes, which we are all enjoying today, is miniscule, compared to the unsustainable 29.8% spike in federal government spending. Perhaps Obama should have picked a different decade. Although it may be true that in the single year of 2010, personal taxes declined to 6.2% of GDP, versus the 7.6% average of the 1950s, or by -18.4%; at the same time, government spending has skyrocketed to 25.5% of GDP, versus 16.4% in the 1950s, or by +55.5%. So in 2010, personal taxes declined by -18.4%, while federal spending increased by +55.5%, compared to 1950s averages. So what’s wrong with this picture? Should we just adopt the 1950s tax brackets and then jack the rates up by 73.9%? Back to the point of Obama’s tirade: Although in terms of tax brackets, it would appear on the surface that we are paying lower taxes today, than our ancestors who worked in the 1950s, there is one additional item to consider. Without getting into all the other taxes we pay today, which either were not around or at least not as burdensome in the 1950s (i.e. federal fuel taxes, airline ticket taxes, state and local taxes, and such), FICA payroll taxes were much lower in the 1950s compared to today. Is the FICA tax a tax? We know that the Federal Insurance Contributions Act (FICA) is codified at Title 26, Subtitle C, Chapter 21 of the United States Code. And that the FICA tax is a United States payroll (or employment) tax imposed by the federal government on both employees and employers to fund Social Security and Medicare —federal programs that provide benefits for retirees, the disabled, and children of deceased workers, etc… And we know that the amount that one pays in payroll taxes throughout one’s working career is indirectly tied to the social security benefits annuity that one receives as a retiree. Yet while some folks claim that the payroll tax is not a tax because its collection is tied to a benefit, the United States Supreme Court decided in Flemming v. Nestor (1960) that no one has an accrued property right to benefits from Social Security. Add to that the fact that the Trust Funds have been looted, and it is clear that the FICA tax is really just a tax. My basic rule of thumb is that, if it comes out of my paycheck, and goes to the federal government, it’s a tax. In 1950, the Old-Age, Survivors, and Disability Insurance (OASDI) tax rate levied on both employees and employers was just 1.5% of the first $3,000 in wages ($3,000 in 1950 was equivalent to $27,451 in 2010). And by 1959, the rate had increased to 2.5% of the first $4,800 in wages ($35,866.96 in 2010 dollars). There wasn’t any Medicare tax in the 1950s, as it was not implemented until 1966. 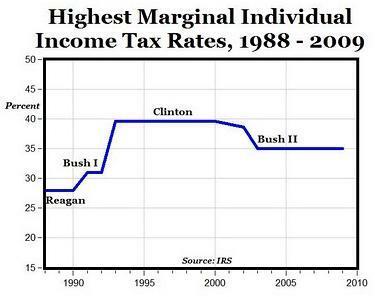 Historical FICA tax rates are shown below. As most of us working today are aware, beginning in 1990, the OASDI tax rate was increased to 6.2% of the first $51,300 in earnings, and the wage base has increased each year since by increases in the national average wage index. Also beginning in 1990, Medicare taxes were assessed at the rate of 1.45% of the first $51,300 in wages, and the wage base was stepped up to $125,000 in 1991, $130,200 in 1992, $135,000 in 1993, and has been levied without earnings limitations since 1994. Most of today’s workforce is also aware that since 2009, the OASDI rate of 6.2% has applied to the first $108,600 in wages, while the Medicare tax of 1.45% has been levied without limit (see chart below). By the way, Medicare taxes are scheduled to increase in 2013, for those who are not paying their “fair share” today. So if we add social insurance taxes, since they are a tax, to personal income taxes, and compare the total amount of taxes paid in the 1950s to the present, are taxes still lower today? Well, per the chart below, the average amount of combined social insurance and personal taxes paid in the 1950s was 9.7% of GDP, versus an average of 14.3% for the decade ending in 2010. So it turns out that the total amount of taxes the federal government collects from us today are 47.4% more than in the 1950s. This might explain why many of us feel as though we are taxed enough already. But how would we know without first checking the facts? What is clear, without question, is that taxes are a heck of a lot lower today, than they were when they reached a record 17% of GDP in the year 2000. Also of note is the fact that government spending only represented 18.8% of GDP in the year 2000, or about the same as it was in 1969, versus a disgraceful 25.5% in 2010. The Point: The fact that we are paying 6.2% in Social Security taxes on the first $108,600 of earnings today, whereas the rate was only 2.5% of the first $4,800 in 1959; and that we are paying an additional 1.45% in Medicare taxes on an unlimited amount of earnings today, whereas the tax did not exist in the 1950s; means that the amount of taxes paid by individuals, as a percentage of GDP, is much greater today than it was for those living and working in the 1950s. In fact, the total amount of taxes Americans pay today is at least 47.4% greater than it was in the 1950s. It’s also interesting to note that the amount of taxes paid in 2010 was exactly the same, as a percentage of GDP, as paid by those who lived and worked in 1970 (see the chart above, data here). So what’s the bottom line? The bottom line: If Obama wants to go back to the 1950s, let’s go. But it’s not going to work unless government spending follows suit. So cut government spending from 25.5% of GDP, back down to 16.4%, and you’ve got a deal. But I’m afraid that short of passing the Monetary Reform Act, the next step forward is another shellacking. But that’s a given. America lacks leadership. Either you’re hot, lukewarm or cold, but attempting to divert attention away from the real problem, excessive government spending, towards some make-believe injustice since the 1950s, is so far from the mark that it’s almost incomprehensible. As I see it, there are two problems with Obama’s sound bite. First of all, 51% of the current American workforce doesn’t pay any income taxes at all (i.e. not paying their fair share). Secondly, the injustice du jour lies not in the amount of taxes being collected, but rather in the amount of money the federal government is squandering. It would appear that with Obama, all roads lead to Athens, or is it Rome? Great post & tables. But, you fell for the FICA & Medicare hidden tax. I'm not surprised as most Americans have fallen for it too. Employees ONLY see the FICA 6.2% and Medicare 1.45% taken from their paychecks. They never see the employer's matching payment! This is a hidden cost that gets buried with unemployment taxes and other costs/benefits tied to employees that average about 40% of pay. Thus an employee getting paid $10 per hour likely costs a business $14 per hour because of these hidden taxes and benefits. FYI. Healthcare looks like it was going to push this employer cost up by another 10% or so because of it's mandates. Is there any wonder why employers are holding off hiring more people because of these unknown costs? I'm with you. To clarify, the personal tax line, which is included in the first chart, only includes personal income taxes, as pulled directly from the BEA's NIPA tables. The second chart includes social insurance taxes, also from the NIPA tables, which is comprised of the employer and employee portions of social security, and Medicare, and also the employer's federal unemployment tax. I didn't clarify that in the text, but I started to. Obama must be rubbing off on me in that I left it for the reader to figure out. This is a fairly good apples to apples comparison though, so either way, we are paying more taxes today than we did in the 50's. JFK was right – lower tax rates brought in more revenues, the only failure has been on the spending side. It made no sense for Obama to raise spending like he did, knowing the situation. He is guilty of negligence, at the very least. Thats not even what the Presidente was saying. He meant that a smaller group of rich people are running the country like a big corporate vampire while wearing the mask of government sucking the life out of the debt slaves. That's a stretch! He said, “If you're a — if you are a wealthy CEO or a … hedge fund manager in America right now, your taxes are lower than they have ever been. They're lower than they've been since the 1950s.” But it turns out taxes are much higher today than they were in the 1950s. I have no idea how you get your comment out of what he actually said. If what you say is what he meant, then that's what he should have said.